The last governor of Dakota Territory and first governor of South Dakota will be brought to life during a program in Pierre. Arthur Calvin Mellette will be portrayed by John Timm of Sioux Falls during a meeting of the History and Heritage Book Club. The free program begins at 7 p.m. CDT on Tuesday, May 13, at the Cultural Heritage Center. Everyone is welcome to attend. “This year the state is observing its 125th anniversary of statehood. We’ve invited Gov. Mellette to step out of the pages of history books and visit with people about how he experienced his time in Dakota Territory and early South Dakota,” said Michael Lewis, president of the South Dakota Historical Society Foundation. The foundation sponsors the book club and is the nonprofit fundraising partner of the South Dakota State Historical Society. The program is made possible through a grant from the South Dakota Humanities Council, an affiliate of the National Endowment for the Humanities. Mellette was born in Indiana in 1843. He was appointed territorial governor in the spring of 1889 and was elected governor of South Dakota that fall. He served as governor until 1893. Timm has been performing living history portrayals of Mellette at schools and museums, to organizations, and at church and community celebrations statewide since 1999. He became interested in Mellette when he was a costumed docent at the Pettigrew Home and Museum in Sioux Falls. Mellette guided the young state through difficult times. During a period of prolonged drought, Mellette raised a large supply of food, seed grain and fuel for those in need and administered these at his own expense. Mellette had used his home and real estate holdings as collateral to secure a loan from a business associate, state treasurer William Taylor. When it was discovered that Taylor had misappropriated funds from the state treasury, Taylor fled to South America. Mellette arranged for all his property to go to the state to cover Taylor’s obligations. 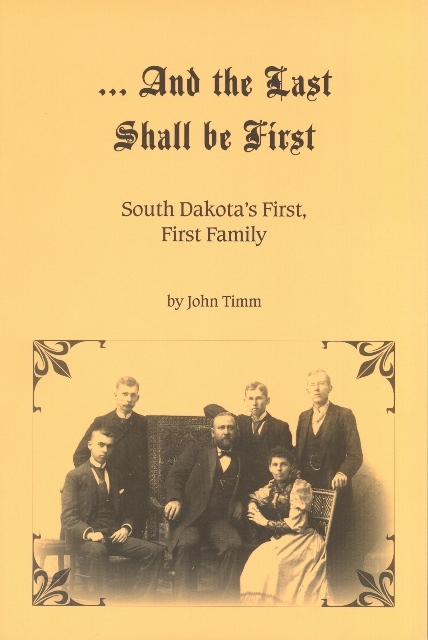 Timm is the author of “ … And the Last Shall be First,” about the Mellette family. The book is the book club selection for May and is available at the Heritage Store at the Cultural Heritage Center and the Capitol. History and Heritage Book Club members receive a 10 percent discount and South Dakota State Historical Society members receive an additional 5 percent discount when they purchase the book at either Heritage Store. For more information about the History and Heritage Book Club, please call (605) 773-6006.